Rivers State Governor, Nyesom Ezenwo Wike has declared that the APC Federal Government through the Office of the National Security Adviser (NSA) has directed the Independent National Electoral Commission (INEC ) to work with internet service providers to shutdown internet access during the forthcoming elections. He spoke on Thursday during a courtesy visit by Savannah Centre Council on Peaceful and Violence Free in Nigeria at the Government House Port Harcourt . He said: “The National Security Adviser has met with INEC to ensure that internet service providers shutdown the internet, so that foreign bodies won’t see what’s happening in the country during the elections. “They will jam all the frequencies and internet services to stop real time communication during the elections. “This plot to rig the forthcoming elections is a recipe for violence. They will not succeed in whatever they are planning . The world will be informed about their criminal activities “. He advised President Muhammadu Buhari to emulate Former President Goodluck Jonathan who placed Nigeria above personal consideration. “There was no litigation. He went back home and did not generate crisis “, he said. 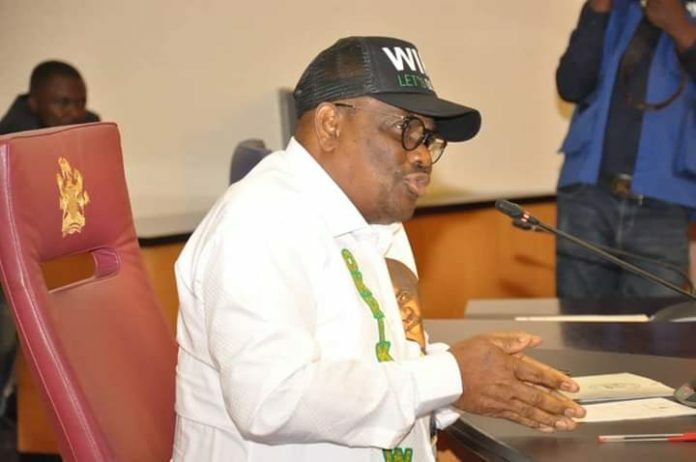 Governor Wike said that Rivers people will not fold their hands and allow the APC Federal Government unleash violence and rig the 2019 elections. He argued that the conduct of credible elections rest squarely with security agencies and INEC. He said once the two agencies act within the law, the poĺls will be credible polls. Former Minister of Foreign Affairs and Founder of Savannah Centre Council on Peaceful and Violence Free in Nigeria, Prof Ibrahim Gambari called on all stakeholders to work towards peaceful and credible polls. He said that the group is involved in extensive research and consultation to promote peace. He noted that peace and development are intertwined, hence they must be encouraged. Gambari urged Governor Wike to use his national contacts to enhance the culture of peace. Former Director-General, Institute for Peace and Conflict Resolution (IPCR), Prof Oshita Oshita urged the governor to continue to work in the interest of peaceful polls.